Sapphire and Diamond Cross, the Gorgeous Horse is your source for custom equestrian jewelry. One of our new additions to our line! 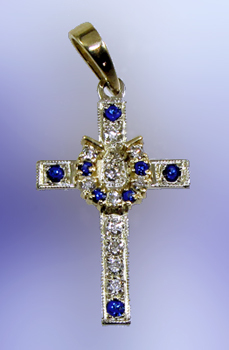 The horseshoe on the cross makes this a wonderful one of a kind piece, set with .26 ct of diamonds and .20 ct of sapphires. Available in yellow gold, white gold, sterling silver, and many differnt diamonds and gemstones.